When Rachel Goeden first started running nearly five years ago, it was part of a bet. Now, she considers running something she can’t live without. In fact, she loves the sport so much that she started We Run This – a nonprofit organization dedicated to introducing women to running and helping them achieve their goals. 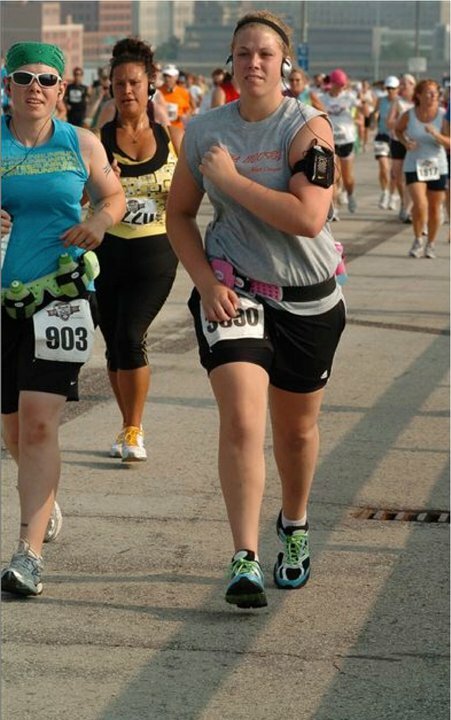 Read on to learn more about this incredibly inspiring MKE runner! Favorite workout: Honestly, the long run! It gives me serious “me” time and I enjoy all of the preparation that goes into it. Favorite distance to race: So far – 13.1 I have young kids (twin 3 1/5 year olds) and work full-time. Anything over 13.1 requires A LOT of early morning runs which requires A LOT of early bed times. Favorite post-race treat: Craft beer, hands down. Training for this year’s Ragnar Relay Ultra, I bought a higher-priced beer for a post-run treat after every double-digit run. It helped in the hard miles and I got to try some really great beer I wouldn’t have otherwise justified spending money on. Amphipod RunLite Air Stretch belt – totally customizable, comfortable and doesn’t bounce. Tafosi Polarized Sunglasses – In winter, the polarization helps you tell what is ice and what is just wet sidewalk. The most under-rated “must have” winter gear, in my opinion. Road ID – I’ve worn one for two years now and have only run probably five times without it because I lost my first one. I pay $10 a month to have my profile online for extra piece of mind. What role has running played in your life? Running has taught me how to be confident and that it is okay to show it. Through running I have become a better parent, wife, worker and person. Do you have a quote or philosophy that inspires your running? I recently watched a TED talk with Zoe Ramano, who this summer ran the entire Tour De France course. She said “It’s easy and it’s lazy and it’s unrewarding to let vulnerability be the deal breaker. Rather than trying to make the uncertain certain, let’s instead get comfortable being uncomfortable.” That really stuck with me and is guiding my ultra training. Every big race, I always write GBoGH (Go Big or Go Home) on my hand/arm, because it is something my little sister told me early in my running and seeing it reminds me how many times I “went big” and decided to run and not just stay at home. Why waste all of that not giving the race my all? Can you tell us a bit about We Run This? At We Run This, we believe in “Don’t just talk about it, be about it!” Founded in July of 2011, We Run This was built with a vision of introducing running to women of all walks of life and building a community where they are supported, motivated and accepted. We Run This is not here to just tell you WHAT to do but come along with you on the journey. We want to hear your stories and encourage you to go further, faster or harder than you ever thought possible and smile a lot along the way. Whether you are running to make friends, lose weight, for a cause or for some you time, we are here for you! I got the idea for We Run This while helping my little sister through her first half marathon (Summerfest Rock ‘n Sole 2011 . . . yes THAT half). It was a hard, hot race, but I had a lot of fun getting her through it. I wanted to give back to the community that had given me so much. So I started online with Facebook and Twitter doing daily motivations and answering question. Then I started blogging about training, injury, races, life and being a mid-packer who doesn’t fit the mold of what people think of when they think runner. This year, we were able to grow into monthly women-only, in-person runs. The runs provide a safe place for women to feel comfortable at their own pace. It also allows women to explore parts of Milwaukee they may not feel comfortable exploring alone. Next year there are big plans to help women across some finish lines! Are there any upcoming We Run This events? We hold a monthly women-only run from a unique eatery/drinkery or other unique spot. In September, we are running from Three Cellars in Franklin. For more info, visit www.threecellarsrun.eventbrite.com. November is TBD but if you connect on Facebook and Twitter, you’ll be the first to know about runs. How did you get started with running? I started running on a bet. A friend of mine and I had started working out around the same time. I was “only” trying to lose weight and had no interest in running. I was one of those people who said “I only run when being chased”. My friend wanted to run a 5k and we made a bet on who could do so faster. Though we ran different races, I ran mine fastest (in 33:17; my PR is now 27:55). I was hooked that day. I was training for my first half marathon when I met my kids for the first time! They were premature two-month-old twins who my partner and I were to become foster parents. They fought through SO MUCH to stay alive; if that is not motivation I don’t know what is. Now I love running for the health it brings me, the community it grows and just to be outdoors. What advice would you give to a newbie runner? Don’t be too shy to get out there. Run with all different kinds of groups and meet people. Even if you think you are “slow” or will be “last” having people around will help you attain goals, get advice and have fun. Where are your favorite places to run in Milwaukee? The west part of the Oak Leaf Trail is a quarter mile from my house so I run that a lot. I really like the park that goes under Bluemound to Underwood Parkway and into Wauwatosa. I have really been loving the Whitnall Park trails, too! If anyone wants to come explore, I’d be happy to show them around. What are your favorite Milwaukee races? The Milwaukee Lakefront Marathon was my first last year and it was such an amazing experience. I love the swag, the route and the volunteers/staff. I hope to run this year, but I have been dealing with an injury and my goal race is 3 weeks later, so I am playing it by ear. Run Into The New Year is great as well. I don’t like running in State Fair Park but I will do it every year for this event! I can always convince friends/family to run a race where you get a bottle of Champagne. It’s a great way to get in the last miles of the year. Finally, it’s not IN Milwaukee but it runs THROUGH Milwaukee (kind of) so I’d be remiss if I didn’t mention Ragnar Relay Chicago. It is the most fun I’ve ever had running! I ran 2012 with 12 people and 2013 with six. This year was a seriously life-changing experience for me. You learn a lot about yourself as a runner and a person in those 32 hours. What are your running goals for the upcoming year? I am running the Surf the Murph 50k (my first) in Savage, MN on October 26th, so it really depends on how that goes. I would like to get faster and break two hours in a half marathon as well as run more races and maybe go further than the 50k distance. 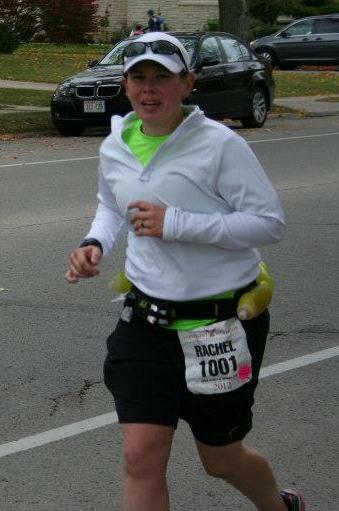 I am also a Ragnar Chicago Ambassador for 2014, so I will be running Ragnar Chicago as part of another We Run This team. I have some BIG plans to include as much of my community as possible this year. If you’re a runner in MKE, we’d love to chat with you. Send us an email at keeprunningmke@gmail.com if you’d like to be featured or know someone who should be featured in an upcoming Let’s Get to Know . . . post. This entry was posted in MKE Runners and tagged MKE Runners, Rachel Goeden, Running in MKE, We Run This. Bookmark the permalink. Pingback: Keep Running MKE | Are You Ready to Run Like a Mother?